Valašský soubor písní a tanců Bača was founded in May 1945 in Policna – a part of Valasske Mezirici. Milos Karlik, the ethnographer, became one of the most significant founders of the band. The band has excelled in folklore purity and ethnical adherence thanks to his activities since its foundation. The regions of Valasske Mezirici and Roznov pod Radhostem are systematically presented in the Baca band programs. Single programs are focused on different subjects – from amusing concept of twist, craft, bandit dances to more serious ceremonial theme like eg. wedding songs. Today, the band has two dance bodies – youth 17 – 20 years and seniors at the age of 45 – 70. A part of the band is a female song band, which often appeared at CD recording with the local dulcimer music. In 2002, the band recorded and produced its own CD called "Za pěsničkú do Mezříča". 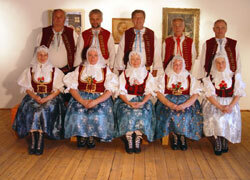 Today, the core of the Baca band is formed by the youth that grew up in the child folklore band Ovecky. However, boys and girls from the families that are getting acquainted with the folklore world gradually are becoming an integral part of the band. 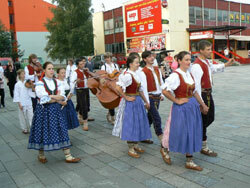 The band takes part in folklore festivals and parades in the Czech republic and abroad, and different cultural events in Valasske Mezirici and its vicinity. Soubor se účastní folklorních festivalů a přehlídek v ČR i zahraničí, ve Valašském Meziříčí a okolí také různých kulturních a společenských akcí. arose on the occasion of the 60 anniversary of the band foundation in 2005. Today, the band has 20 permanent members – dancers who are associated with love to a Wallachian song and who went through the Wallachian band of songs and dances Baca in different periods. They meet regularly and „brush up on“ so-called old programs (Mezříčské trojky, Šátečkový) and also learn new programs hard - Formanské točené, Zatáčaný. Nowadays, the oldest members of the senior dance body are over 80 years old. Nevertheless, their advanced age doesn´t discourage them from participation in all important events of the band. Experienced musicians takes part in these events as well and pass on their longtime experience to the youngest musicians of the Baca dulcimer music. 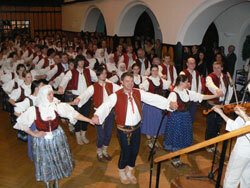 Bačovský bál – traditional ball in all premises of the Cultural amenities in Valasske Mezirici, every year attended by many costumed couples in Wallachian costumes but also costumes of the vicinity, attended by four dulcimer bands. Dětský bačovský bál – „adult-like“ ball for children of the Baca band and Ovecky children (Child folklore band), attended by regular visitors from other child bands. The program is filled out by decorating Easter eggs, gingerbread or making „pomlazka“, braided whip from pussywillow twigs. Valašská liga – meeting of folklore fans with Baca dulcimer music and interesting guests – folklore musicians and soloists in M-club premises in VM twice a year in spring and autumn. The supervisor is Irena Smolkova, choreograph and art director of both Baca bands is Renata Kotasova. The band is accompanied by CM Baca supervised by Ctirady Bryol.